"This quick and easy appetizer is and a great way to impress your guests! Perfect for picnics, too." Thread each lettuce wedge, bacon piece, and grape tomato onto each toothpick, respectively. Arrange toothpicks on a serving platter. 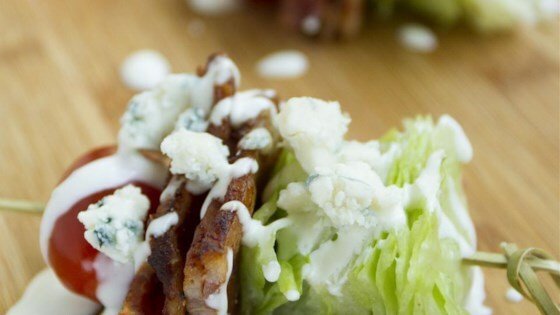 Drizzle 1 teaspoon blue cheese dressing over each and sprinkle with blue cheese. Changed to dressing to ranch, but otherwise fantastic. What a great presentation, and not too unhealthy. Awesome idea... Can't wait to try this out! Yummy! Just add chopped red onion and you've got a winner! ?? Really loved this recipe. I added red pepper to the stick. Delicious.MARYMAKER..